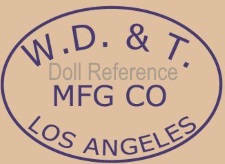 Western Doll & Toy Manufacturing was founded on April 26, 1918 in Los Angeles by Mr. Romeo Caccialanza. Other principal's were B. Muller and W. E. Jones. On March 11, 1920 Mr. Caccialanza filed and was granted patent number 1,297,089. 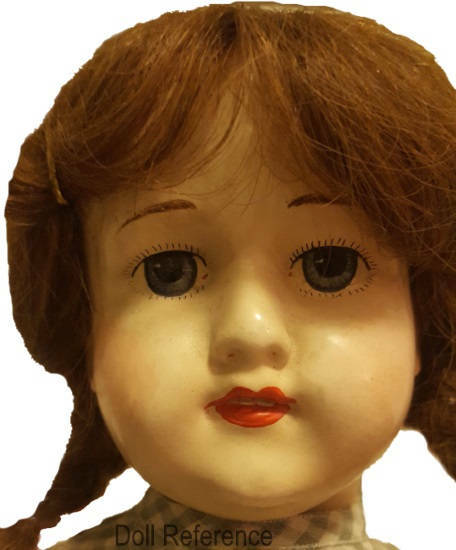 Doll shown on left, is 21" tall, all composition head and jointed body, she is wigged, has single stroke painted eyebrows, painted eyes, upper and lower painted eyelashes, closed painted mouth with two painted upper teeth. She has a composition body that is a copy of German antique dolls, jointed at the neck, shoulders, wrists, hips and we think knees.